Of the few Site tools that exist, Property Line is one of the most fundamental. Almost any site, regardless of size, will have property lines. These can be a significant coordination issue with Architecture, especially on an urban site. 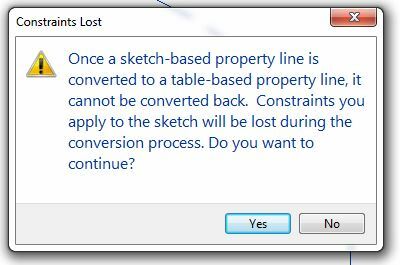 If you do create a property boundary by entering distances and bearings, the property boundary/ lines will need to be moved after created, since there is no way to tell Revit where your starting point should be. While all the warnings are a little little silly, the true problem with Property Lines and their segments is their lack of parameters for arc segments. If you do not have any arc/ curved segments, tagging the property line segments is quite simple. A Tag with the N/S, Bearing, E/W, and Distance parameters works nicely. An arc segment, however, should typically have a few more parameters, including Radius, Angle, and Arc Length. Unfortunately, Revit only provides the Radius parameter. This is a little frustrating, especially since you can go into the sketch, select the arc and see the Arc Length in the Properties Browser. Revit knows the Arc Length, but it is not going to provide it as a standard parameter. But with a few Calculated Values and Shared Parameters you can create both the Angle and Arc Length parameters and put them in a Tag. 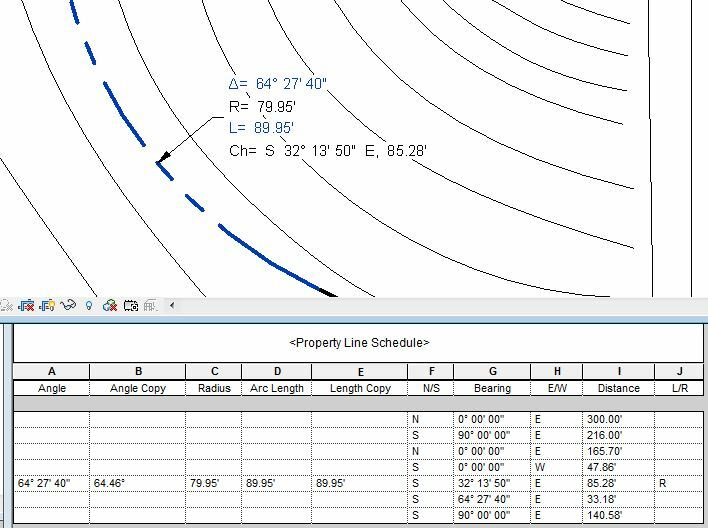 First, create a Property Line Segment Schedule, adding the relevant parameters. For the Angle parameter, create a Calculated Value (make sure Type is Angle) with the following formula: 2 * asin(Distance / (2 * Radius)). If you like, it can then be reformatted to degrees, minutes, seconds. ((Angle * 0.017453) * Radius) / 1°. Now you have the parameters, but to pull them into the Tag, you need to create “placeholder” Shared Parameters for them (similar to pulling plant Count into planting Tags). Here is my Property Line Schedule, with the calculated values and shared parameters (the shared parameters have “Copy” in their name). After filling in Angle Copy and Length Copy, the Property Line Tag for this arc segment fills in correctly (though, you will need to load the Shared Parameters into the Tag). Obviously this workflow (workaround) is less than ideal, as it leaves room for human error. But until Revit decides to provide the appropriate parameters for Property Line arcs, this is how you can do it.